If you tell friends you’ve got a SIG-4 at home, they might seem puzzled. They might also ask you when your interest in Guns or Rockets started. They’ll be surprised to hear that this is actually a Grill. But will they be equally surprised by the quality of the food it produces? The Smart Planet SIG-4 Gourmet Smokeless Stainless Steel Grill doesn’t have the best name recognition after all. Smart Valley is not a major name in grilling. But this is the fun of reviewing Grills because every so often you come across a Gem. Is this a Grill to be remembered? Or, is this one of the many launch failures? I’ll give you the information and you decide. For some reason, they decided to make this model half Griddle half Grill. I’m sure buyers are confused by this regarding what foods to put where. But both sides seem to perform in the same way so no major problem. I just don’t understand why they did this on a small portable Grill. It doesn’t take away from anything the Grill can do, but it doesn’t add anything either so this was a strange inclusion. Overall though the design is shiny, compact, and excellently finished. It looks like they’ve spent time on it and despite the weight of only 9 pounds, it’s very sturdy. Not exactly an artist’s dream in the way it looks, but it’s a by no means ugly box shape and it will be durable. This is not majorly big because it’s being targeted at couples, students and single people. The size is approximately 120 Square inches so you see what I mean. It’ll do two burgers and some vegetables in one sitting. Families of four will need to do two settings. It seems simple but I think this solves a big problem in grilling. Not just Indoor grilling either; outdoor grilling too. 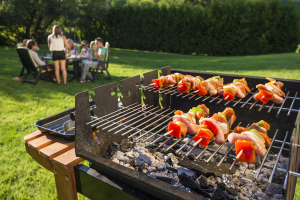 Grill enthusiasts like myself know exactly how long it takes to cook certain foods. We have a sixth sense so we always know what’s going on and that’s because we’ve been doing this for a long time. Most people, however, close the lid of their Indoor Grill and constantly feel the need to have a peek inside to check out the state of their food. Is it done? Is it burnt? How long has it been since I put it in? Lifting lids sacrifice heat and lead to less tasty food, but here the Lid is glass so you can see what’s going on at all times. I was blown away. Novices will love this. On most Indoor Grills there’s a gap between where the lid closes and the base. Here the glass covers the whole of the cooking area without any gaps so there’s no outward splatter or flare-ups burning hands, and this enclosed environment serves to preserve taste in the way Clay ovens do. It heats at up to 450 degrees which is pretty high for an indoor grill which means cook times are shorter than with comparable models. And, the warm-up time after first hitting the on switch is only around 5 minutes meaning you can get started right away. This can be cleaned in the same easy way as a George Foreman. You just take off the Grates. They pull straight out. Boil some water and then pour the water over the Grates. It’s Porcelain-Enamelled so dirt and grease fall right off. We always advise you not to submerge completely in water as this can damage parts. The completely enclosed environment along with the 1500 Watts of power serve to give you fast cook times. There’s a 6-minute warm-up to think about but that kind of thing is common with these small portables. You can do most Steaks and Burgers in under 10 minutes so I was happy. I mentioned that this Grill is easy to clean and it is. But, it’s prone to inward splatter issues. When you cook things that are more prone to splatter, like Lamb for example; some of the juices can find their way down inside the Grill. We’re talking underneath the Grates. You may find a pool of juices here after Grilling Lamb. On these occasions, you’ll have to wipe up that water to prevent bacteria build-up. The Glass Lid is going to be great for novices. You can see inside at all times so no more worrying about what’s happening. Not lifting the Lid will also increase grill times and they’re already rather fast here because of the 1500 Watts of power. 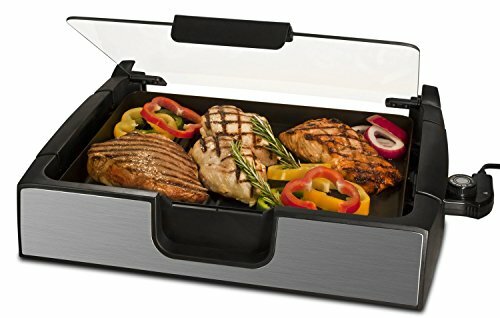 Ultimately though it was the superb enclosed environment created by the excellent Lid that makes for sumptuous juicy Meats and great all-around results. I had issues with the size. It’s on the small side. And I had issues with the amount of internal splatter you get when you cook juicier meats. But these where minor problems in the scheme of things. Overall this is well worth the money. Thank you for reading.